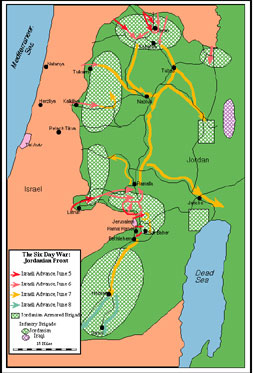 The Six-Day War involved three distinct battlefronts, tied together by a shared desire on the part of the surrounding Arab states to eliminate Israel and erase the shame of their defeat 19 years earlier when they failed to destroy the nascent Jewish state. Egypt, the largest Arab state with a population of 31 million, massed troops on its border with Israel and imposed a naval blockade of Israel’s southern port, an act of war. Confronted with these aggressive moves, and the Arab leaders' promises to destroy the Jewish state, Israel launched a pre-emptive strike against the Egyptian army and airforce. Egypt’s air force was quickly crippled, and a well-executed Israeli ground offensive routed the Egyptian forces in Gaza and the Sinai peninsula in four days. Buoyed by false reports of Egyptian success, Jordan initiated offensive actions against Israel from the eastern portion of Jerusalem and from lands it occupied west of the Jordan river (the West Bank). Israeli forces responded by attacking Jordanian military positions. After a three days of fierce fighting, especially in and around Jerusalem, Israeli forces defeated the Jordanians and gained control of all of Jerusalem as well as the West Bank, the historical heartland of the Jewish people known to Israelis as Judea and Samaria. Following an air attack by the Syrians on the first day of the war, Israel dealt a shattering blow to the Syrian air force. Hostilites continued in the days that followed, and on fifth day of the war, the Israelis mustered enough forces to remove the Syrian threat from the Golan Heights. This difficult operation was completed the following day, bringing the active phase of the war to a close. Select from the left-hand menu for details about the fighting.